Leamington reached the final of the Birmingham Senior Cup for the first time since 1979 after a stunning late, late show against Walsall, writes Paul Okey. Amadou Bakayoko’s 20th-minute strike looked to have settled the tie as game entered the closing stages. 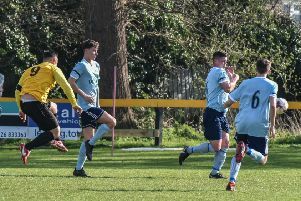 However, Ahmed Obeng’s 87th-minute strike brought Brakes back on terms before substitute Jack Edwards forced home an injury-time winner. Walsall named a strong starting XI with Craig MacGillivray and Amadou Bakayoko having featured in the Saddlers’ League One defeat to Southend last Saturday and Callum Cockerill-Mollett, Jordan Sangha, Kory Roberts and Maxz Kouhyar all on the fringes of the first team. Brakes, who lost Ben George in the warm-up, and were without the cup-tied Richard Gregory and Jordan Goddard, started with recent signing Kurtis Revan down the middle, while Ryan Quinn returned to a youthful bench which featured Charlie Hornby and Charlie Fitzmaurice. A low-key opening saw Cameron Peters sky a decent chance for the visitors after Brakes had been cut open by a simple through ball. The striker showed good persistence to get a shot away under pressure from two defender in the 20th minute, with his effort flicking off the top of the crossbar. Four minutes later the Saddlers were ahead. Richard Taundry gave away possession and Kouhyar’s through ball released Bakayoko who showed good composure to round Tony Breeden and roll the ball into an empty net. It took until the 35th minute for Brakes to fashion a shooting chance, Courtney Baker-Richardson screwing his shot well wide from a difficult angle. However, they ended the half strongly, with Revan showing good pace to get the better of Roberts on the flank and sending in an inviting cross which was cleared from danger by Ben Kendrick. Rob Thompson-Brown’s 25-yard effort then whistled past the post before Breeden produced a fine block at the other end to deny Bakayoko after he had beaten the offside trap. As the rain fell after the break so did the quality with chances at a premium. Taundry and Roberts both had wayward efforts from range, while Kouhyar shot just past the post after pouncing on a poor clearance from Breeden. The hosts stepped it up in the final 20 mintes and Thompson-Brown looked for all the world to have got Leamington back on level terms with a measured shot to the far post but the ball struck the inside of the woodwork and bounced away to safety. Substitute Jack Edwards’ well-struck shot from distance was straight at MacGillivray and Brakes’ luck looked well and truly out when Taundry’s cross cleared everyone and hit the inside of the post, evading a desperate lunge by Callum Gittings. The hosts continued to believe, however, and their perseverance paid off in the 87th minute. Revan, who was looking far more comfortable on the right flank, sent in a superb cross and Obeng was on hand to sidefoot home from close range. With the bit between their teeth, Brakes continued to press forward and Revan was again the supplier for the home side’s injury-time winner, his cross finding its way through to Edwards who reacted well to beat Kendrick drive the ball past MacGillivray. Brakes: Tony Breeden, Richard Taundry, Tom James, Darren Pond (Jack Edwards, 60), Jamie Hood (Connor Gudger, 65), James Mace, Courtney Baker-Richardson (Ryan Quinn, 84), Callum Gittings, Kurtis Revan, Robbie Thompson-Brown, Ahmed Obeng. Subs not used: Charlie Fitzmaurice, Charlie Hornby. walsall: Craig MacGillivray, Ben Kendrick, Callum Cockerill-Mollett, Jordan Sangha, Dan Vann, Kory Roberts, Maxz Kouhyar (Cody Fisher, 84), Milan Butterfield, Amadou Bakayoko, Cameron Peters (Tobias Hayles-Docherty, 79), William Shorrock. Subs not used: Brandon Ganley, Ashley Maddocks, Lezin Cela.